Special Family occasion? If you're looking your best- make sure your pet does too with this stunning sherwani that comes matching with a gorgeous red stole! These are made on order to make sure they fit your pet perfectly. Neck, Tummy and Length (from collar to start of the tail) in inches. Please allow 15 working days for customisation. You have heard of dogs wearing t-shirts. You have heard ofdogs wearing raincoats. You have also heard of female dogs wearing skirts! Youmay have also heard about dogs wearing boots! But have you ever heard of dog sherwanis in India? No, right? 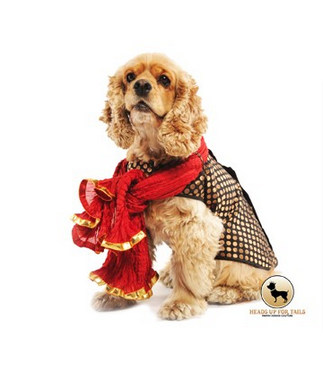 Here is your chance to buydog sherwani online for your pet. Attending a marriage function or a traditionaloccasion in the family? Why should you be the only one who gets to dress up?Give your dog a chance too! This gorgeous black dotted sherwani comes with an attractivered stole which can be wrapped around your dog’s neck. These are made to orderfor your pet so that there is no problem with the sizing at all. All you have to do is email us your pet’s measurements(neck, tummy and collar to the tail) and we will customize this sherwani foryour pet.